There's clearly (no pun intended) a quick rise in the clear shoe trend. So much so that we are deeming it the biggest shoe trend of the summer. Well, one day, while spending too much time on Instagram, as one does, I came across a wild discovery—at least to me it was wild. 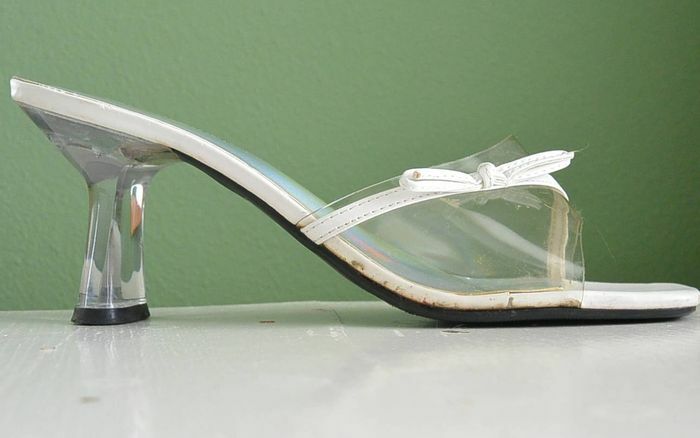 One of my fellow editor friends bought the coolest pair of clear heels on Etsy, and I had never been so jealous. I quickly opened up the site, searched "clear PVC shoes" and was overjoyed with what I found. Coming in funky varieties of shapes with all sorts of unique embellishments, I was instantly convinced that when it comes to this shoe trend, searching for the Cinderella slippers of my dreams should always be done on Etsy first. Beyond the fact that buying this summer shoe trend on Etsy means you are getting a pair no one else will have, it also means you're about to save a lot of money. I was yet again shocked to find that each shoe I loved rang in at under $40. The best versions of the It shoe of the season for basically nothing? That's a shopping hack we're going to tell all our friends about. Below shop my favorite clear summer shoes on Etsy that are under $40 in addition to a few more I've been coveting. This white little bow is so perfect. Floral shoes? Do we even need to convince you? These might just be my favorite pair. The metallic soles and pink bows are honestly too much to handle. Wear these with jeans and a T-shirt for a total '90s look. Just wait until you see the heel on these. Fun fact: This shoe brand used to be known for its trendy clear shoes. A feather moment is a moment we want to live in forever. These plus a gingham minidress will have you being the best dressed girl of the summer in seconds flat. Carrie Bradshaw would spend her rent on these shoes. I own these and get so many compliments on them. These are what we call Barbie shoes. Just the right amount of glitz. Available in sizes 38 and 39. Click in to see the detailing on the heels. Perfect for every cocktail party in history. Polka dots worth every single Instagram. Get on the waiting list for these ASAP if you know what's good. Now these are what we call naked shoes. Available in sizes 8.5 to 9.5. No, you're not seeing things—these are just that good. Feeling like Cinderella yet? We thought so.